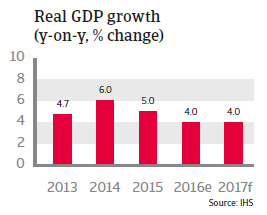 A prudent fiscal policy has limited the consequences of low oil and gas prices, but the economy is vulnerable to a hard landing of the Chinese economy. Form of government: The United Malays National Organization (UMNO) is the leading party in a 13-party coalition-government of National Front (Barisan Nasional, BN). The Malaysian population is an ethnic and religious mix of Muslim Malay (50%), Buddhist Chinese (24%), Hindu Indians (7%) and indigenous people (11%). Despite its majority, the Malay population possesses only about 19% of the wealth. Racial tensions have always simmered under the surface, but have not surfaced in over 40 years, thanks mainly to a massive affirmative action policy favouring ethnic Malays. However, this policy has hindered Chinese and Indian minorities in their social and economic progress. The continuation of this so-called ‘pro-bumiputra policy’ or the possible cutback of it, is one of the major political issues. The Barisan Nasional (BN) coalition led by the United Malays National Organisation (UMNO) has been in power since Malaya achieved independence in 1957. Despite growing electoral successes by opposition parties, UMNO remains firmly in power. However, political tensions have increased since Prime Minister Najib Razak has been confronted with corruption allegations: government investigators found that nearly USD 700 million from a government investment fund was deposited into the Prime Minister’s bank account. The issue has led to street demonstrations against corruption and the dismissal of a couple of ministers, exposing severe wrangling within the administration and the UMNO party. 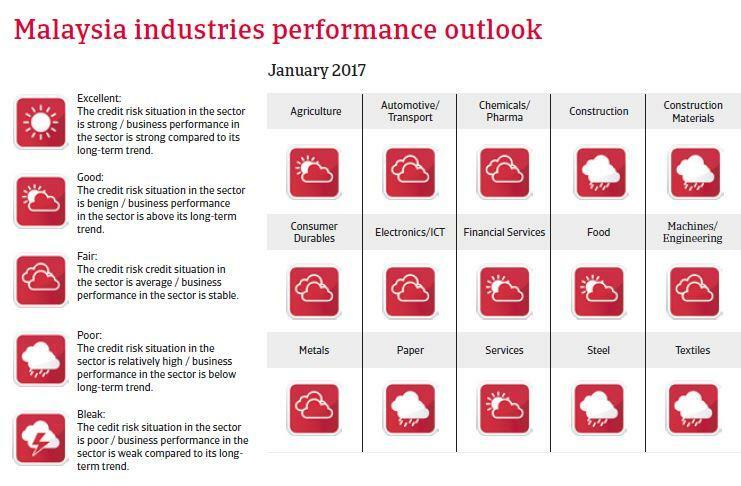 Malaysia´s economic growth slowed down in 2016 due to lower oil prices and decreased demand from China, and both factors will continue to affect GDP growth in 2017, although exports are expected to pick up slightly. Economic growth is mainly driven by private consumption and investment. While oil and gas exports are important for the Malaysian economy, low prices do not pose a risk for growth perspectives in the long term. The economy is diversified, and while exports of oil and gas account for about 22% of total exports, machinery and transport equipment account for 45%. 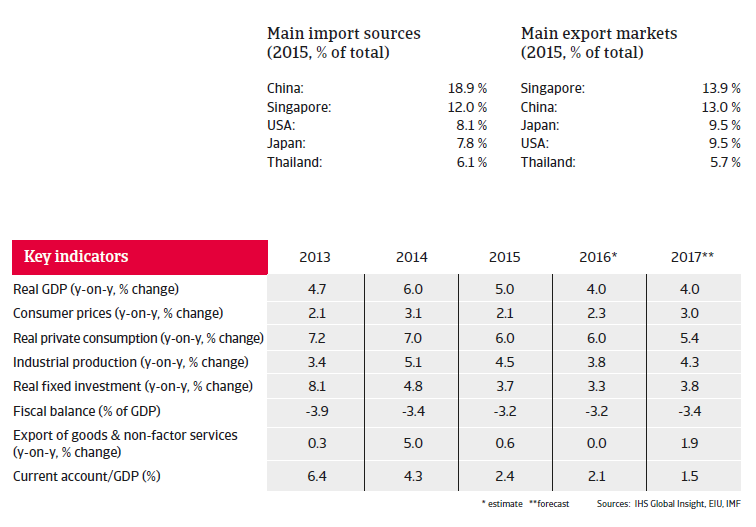 The main risk is a hard landing of the Chinese economy as a main export destination. A prudent fiscal policy has limited the consequences of low oil and gas prices, by raising tax income and abolishing subsidies on fuel and sugar. That said, the goal of a balanced budget in 2020 will probably be reached later. Malaysia has a well-developed financial sector, with well-capitalised banks, good credit quality and a low share of non-performing loans (about 1%). However, a risk factor is the high level of private debt, which could become a problem if interest rates rise substantially. The Malaysian ringgit will likely depreciate further in 2017 in light of tighter US monetary policy. Due to its relatively high level of debt denominated in foreign currencies, Malaysia is vulnerable to weakening investor appetite for emerging markets. While the financial mismanagement scandal around Prime Minister Najib could affect general business and consumer sentiment, the consequences for political stability will be limited, even if the Prime Minister is forced to resign.